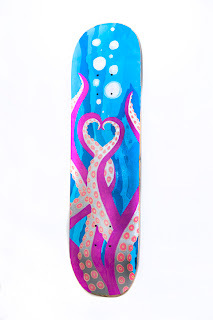 Kicking off the Venice Art Walk weekend is a skate and surfboard auction featuring reused, recycled, and recreated skate decks and boards by more than 70 artists. I had the pleasure of bumping into Lizzie Armanto at the Tony Alva skate show last month. She is incredibly humble and has a great head on her shoulders. By the end of our interview she showed me a short skate/travel video of her spring break trip to Florida she herself, shot and edited all on her iphone. It reminded me of rolling down a water park wet slide, hilarious too. KC Girls and skateboarding, it may seems like the norm but how many girls on a typical day do you see in the bowl with you? KC What do girls wear? It's fascinating to see the changes in skater styles. You mentioned cutting up a trash bag to make it into a t-shirt. LA I wear what I like, I'm a jeans & a T-shirt kind of girl but I usually alter clothes I get, to my liking and make it my own. I like girly clothes on occasions too. I try to find clothes that are form fitting, yet have air flow and I try to avoid grey for the sweat factor. LA My home park is the Santa Monica Cove. My favorite park is at the Block in Orange, where's home to the Combi pool. KC What does your grandmother think? LA She think I'm too fragile to do be in this sport, but I've ended up proving her wrong and she supports me now. KC What would you say to other girls who are contemplating becoming a pro skater? LA Find your niche and stick to it, be who you are. 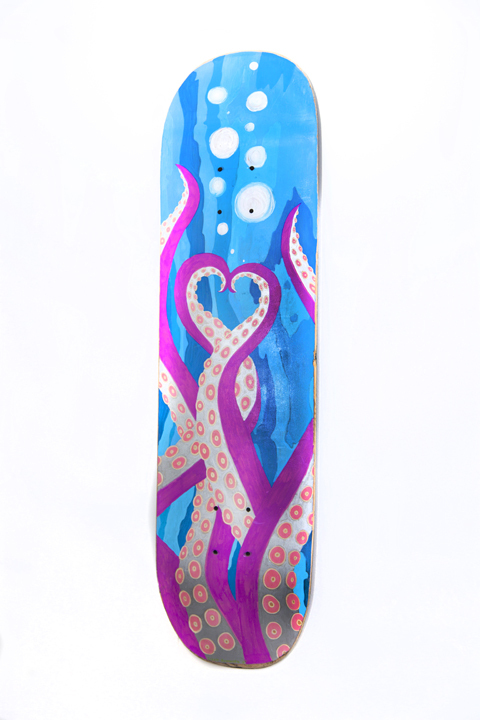 KC Tell us about your design you markered up on the recycled skateboard. LA The design is based on the sea monster Charybdis of Greek mythology. Originally a water nymph, and the goddess of the tide. She best was known to ride onto the land, flooding and inundating towns, forests and beaches alike. The heart is the connection between Scylla and Charybdis, the sinkable sea monsters. KC Where to next? Graduation, College? I'd love to find a major sponsor and possibly see what I can make of myself in the film industry. Venice Family Clinic's mission is to provide free, quality health care to people in need. Established in 1970 by founder Phillip Rossman, MD and co-founder Mayer B Davidson, MD, the Clinic has grown from a small storefront operation into the largest free clinic in the country. With the help of more than 2000 volunteers, including over 500 physicians, Venice Family Clinic provides a medical home for close to 25, 000 patients through nine sites in Venice, Santa Monica, Mar Vista, Inglewood, and Culver City. Serving low income men, women, children, teens and seniors who lack private health insurance, the Clinic is a highly respected and valued training site for 44 programs in the areas of medicine, mental health, social work, nursing, pharmacy, public health and health administration, and integrative medicine. The Mission of the Venice Family Clinic Foundation is to support the programs of Venice Family Clinic.